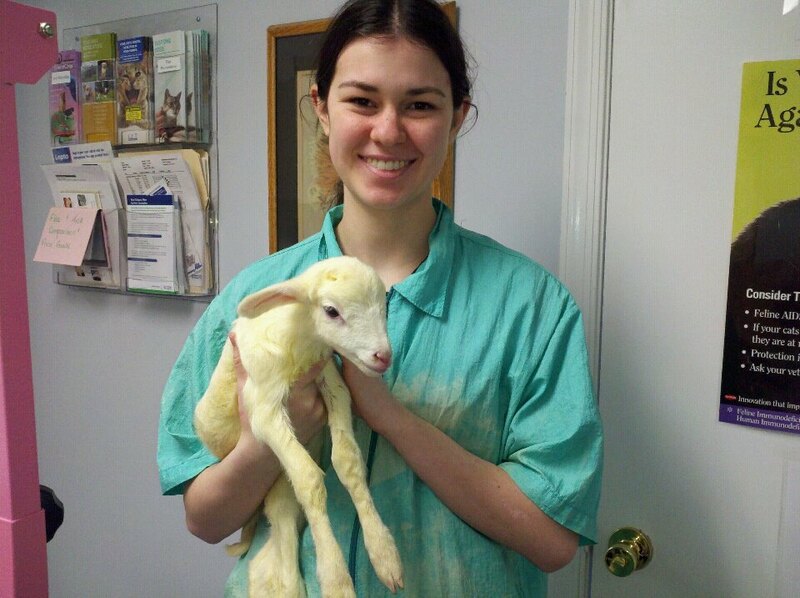 Whether born prematurely or on time, the wagging tail of a lamb is a beautiful sight. When warm milk hits their bellies, their tails wag. When they play tag in the field with their cousins, their tails wag. When their digestive system is working the way it needs to..their tails wag. 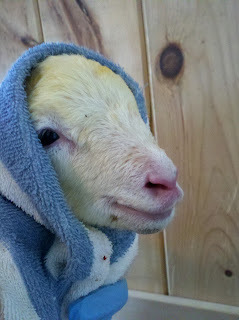 The wagging tail is a sign that all is well in the life of that little lamb. Our first orphan lamb was born this week - he was a twin and almost a 1/4 the size of his brother, weighing just over 4lbs. Assisting his mom with his brother's birth, I was already there and waiting for this little guy to show his face. His mom is very experienced in lamb birthing and rearing and I still have much to learn from her. With little effort, the tiny twin arrives and as his small woolly body hit the ground - his mom takes one sniff and walks back to her firstborn. 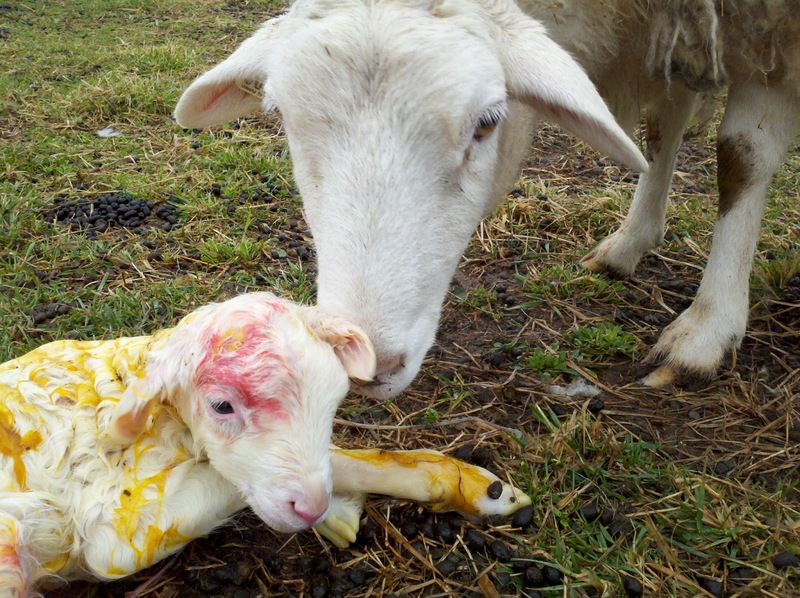 Her first born, being less than 10 minutes old, was already attempting to stand. I watched silently as this sweet bond was forming with her firstborn. She talked to him lovingly and spoke the words of encouragement he needed to keep trying to stand, no matter how many times he kept falling back down. In the meantime, the tiny twin is still laying unattended on the cold ground. 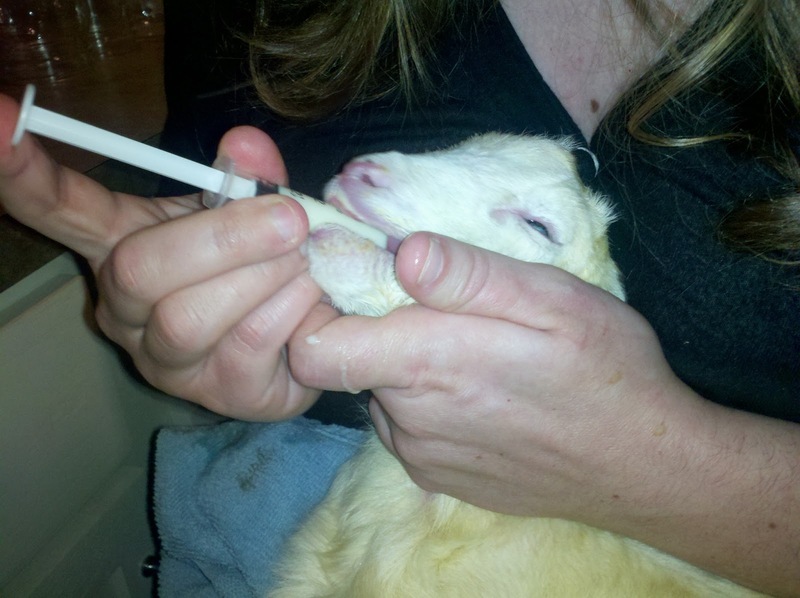 I had cleared his airway immediately but left the rest of the clean up for his mom because I know how important this is in creating that strong bond between mother and lamb. But his mother paid no mind to his needs or whimpers. It is a humans first instinct to step in when we see an animal struggling. This was not the first time I've seen this happen and quite likely not the last. So I processed and weighed the options. I allowed some more time to pass before making the decision to put the tiny struggling lamb next to his flourishing brother to see if this would encourage his mother to bond with him. But she did not. In fact, she did the opposite and tried to remove him from his brother's side. By this time the firstborn was already standing and stumbling a bit - but walking. So their mother walked away, leading her firstborn and leaving the struggling twin behind. Because I know this mother so well, I knew in my heart...besides his obvious premature size...something was wrong with this tiny little boy. But unlike his mother...I could not leave him. I am not recovering from pregnancy and birth or saving all my strength and energy to continue to feed and nurture a newborn from my body...so I swooped up his now shivering little body and began cleaning him. Even between a shepherd and lamb, there is a bond that forms during this time. His body once limp and turning blue is being restored to life and a bright pink color. The stimulation is exactly what he needs. I wrap him in a warm towel that I had been saving inside my sweatshirt and we head for the house. Once inside, I turn on the heating pad and make a temporary nest for him - just like his mother would have. I take his temp, it's still below what it should be...so I continue to rub and rub before finally sticking him inside my sweatshirt, next to my skin, where he can start to absorb my body heat. While he's resting from his rough start in life, I head for the freezer where I have cubes of colostrum that I've collected from other moms in the past..saved for just this kind of occasion. The colostrum is a deep yellow and so thick it's almost pasty as it thaws. This first milk which is packed full of vitamins, is exactly what he needs to get his belly functioning. About the time I have a bottle ready, he's lively and ready to drink. Unable to stand, I swaddle him in my lap and he quickly downs 2oz of the miracle milk. His tail wagged but he's exhausted. The heating pad is nice and toasty and the nest welcomes his little body and together they rest for a couple of hours. This routine was repeated for almost 48 hours before this tiny little fighter finally gave up and let go of life. 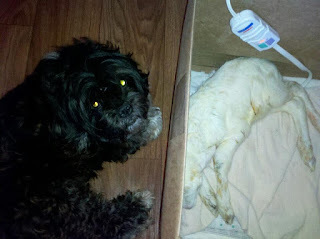 His last several feedings, his tail was no longer wagging and I knew his time was close. I'm reminded often of how much I should be grateful for...but nothing makes me reflect and be more thankful - than at a time like this. There was something that wasn't right with this sweet little boy and his mama knew it. Maybe I knew it too. But a shepherd does what they have to. There are no regrets. I would do it again and most likely will. There are wins and there are losses. I'm also reminded to not count the losses but to learn from them. Learning is hard and painful sometimes..but still, without hesitation, I would do it again. In precious memory of all my little woolly fighters who allowed me to love them but were brave enough to let go.